A bit after six, still cold, however we decide to rest on a beach. Every fifteen minutes more sunlight timidly emerge from behind coastal high-rises. The next comes breakfast. We order churros in a nearby bar. These are disgustingly fat and excessively sweetened snacks. Perfect with your morning white coffee. We take a swim in the Atlantic Ocean. Yes that is right, in the Ocean, as Cadiz is located west of Strait of Gibraltar, which separates the Atlantic and Mediterranean basins. Facing Cadiz. A walk on a quiet, increasingly more populated southern coast brings us to a promenade, from where we go towards the old part of town. Cadiz is said to be a typical Andalusian town. I notice a strong influence of Arab culture, as seen primarily through the cobbled streets and pastel buildings made of sandstone. The southern influence makes a perfect match with the Mediterranean, semi-arid landscape. The city mixes both tradition and modernity. 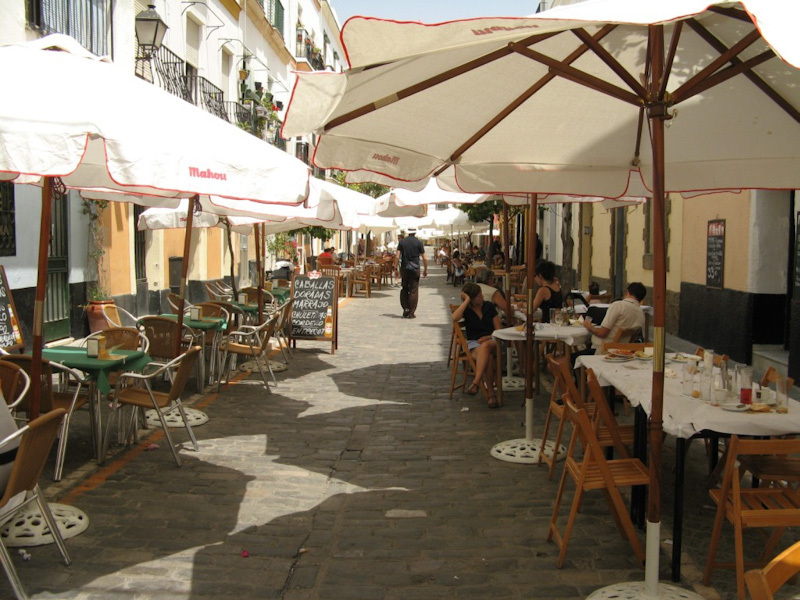 Narrow streets lead to open spaces, often filled with dining tables. Plaza de la Catedral is one of those places. With a large cathedral in the center, you will find traditional restaurants with shaded tables. The city takes pride in being one of the oldest inhabited cities in Europe. The history of early settlers dates back to over 1000 years B.C. That is a long time, nevertheless some things do not change. 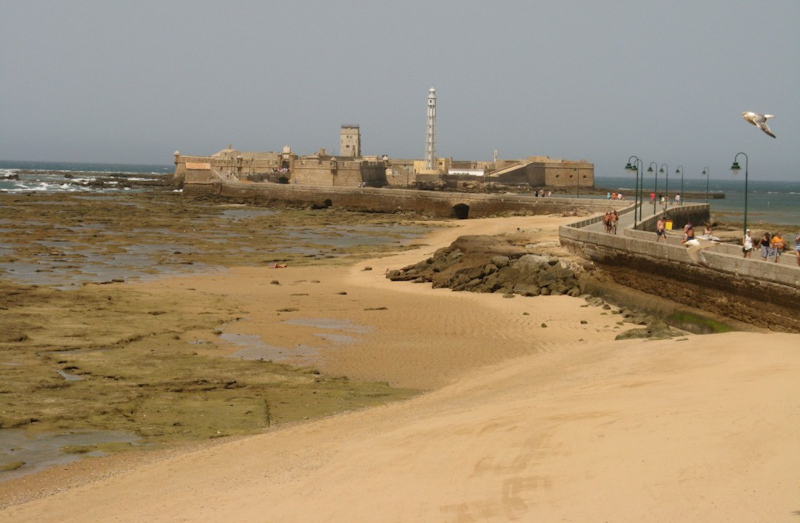 Causeway on the Playa la Caleta enters a few hundred meters into the ocean and leads to a mysterious-looking fortress of Castillo de San Sebastian. During high tide the water is not deep enough to perform jumps off the causeway pretty high above the sea level, however for locals it is not a reason for not jumping. I see a really fat guy jumping from at least six meters height head down into a maximum of two or three meters deep water. I had a serious impression that I would not see a guy emerging. He emerged. Maybe it’s a pro. Interesting are holes in coastal rocks by the causeway. In between a geyser-like fountain is created as a result of periodic massive waves. The powerful wave can pour a substantial water shower onto the entire width of the dam completely soaking the passersby. The winding and narrow alleys effectively protect against the merciless sun. In turn, with a relatively dry air, heat is generally not so bad. The nightlife starts thriving. There is uproar in the streets with crowds of people walking around. The restaurants set up their stalls using the entire width of the already extremely narrow streets. To eat well you have to sign up on the waiting list. Finally it is our turn. 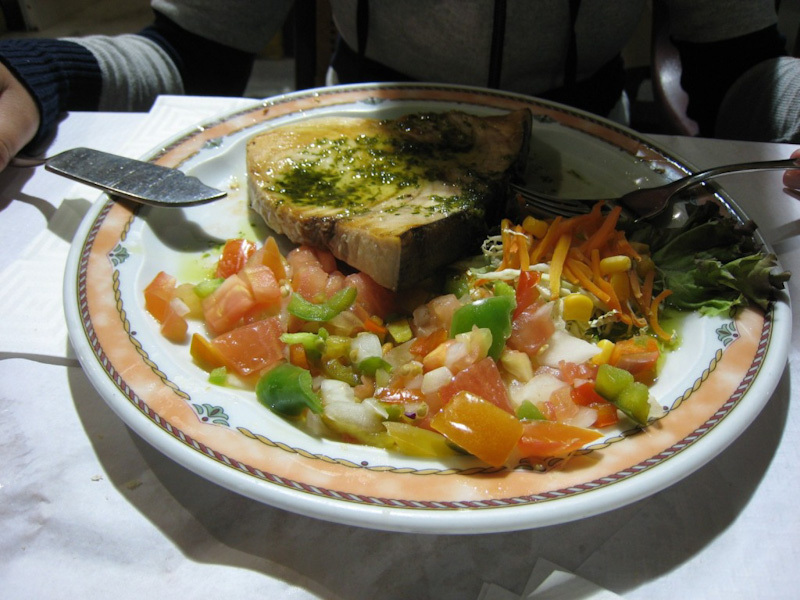 On my plate I get el emperador, well cooked and tasty saw-fish. A warm Andalusian night goes on. We find a place at the bay. At low tide there is only a field of boats ran aground. In the morning there is a lot of crab seekers scattered here and there on the rocks along the beach. I join them only to find that perhaps this is not my day. I tell myslef that all the crabs have already been caught today.